O P H I U C H U S ... THE 13TH WARRIOR ? OPHIUCHUS occupies a position along the Ecliptic at the Center of the Milky Way Galaxy. Why is so little attention paid to a constellation that rises in so prominent position at the Winter Solstice. When would it have occupied the Heliacal Ascending Position at the Winter Solstice? At what degree of tilt would the Earth have had to be for this to occur? CONSTELLATION & STAR MAPS . WHERE IN THE ZODIAC IS OPHIUCHUS? . A "Man from Marduk ...?" A 13th "Warrior" Sign of the Zodiac? Both The Ecliptic and The Milky Way pass thru the the constellation of Ophiuchus ... and Ophiuchus just happens to occupy the space between Scorpio and Sagittarius; (between & slightly above). Hercules' head is upside down and almost touching that of Ophiuchus. Actually, the Winter Solstice makes its heliacal appearance in Ophiuchus before "arriving" in Sagittarius as viewed from the Giza Plateau. Ophiuchus shows a man ... carrying or wrestling with ... a serpent...actually the Constellation known as SERPENS. His outstretched hand was known as containing "evil stars" and one of his names was "the Man of Death". His foot crushes the head of the Scorpion. The Sun itself enters Ophiuchus on November 30th. From November 21st to the 16th of December as the Sun travels through Libra, Scorpio, & Sagittarius, it spends 9 days in Scorpio ... but 16 days in Ophiuchus! Babylon counted Ophiuchus as its 25th ecliptic constellation. Though Ophiuchus is not listed among the "official" signs of the Zodiac... maybe it was in earlier times. Why does it no longer... since it occupies such a prominent place in the sky and actually straddles the Ecliptic? NOTE: Only the constellation of Scorpio exactly equals a Platonic Month. 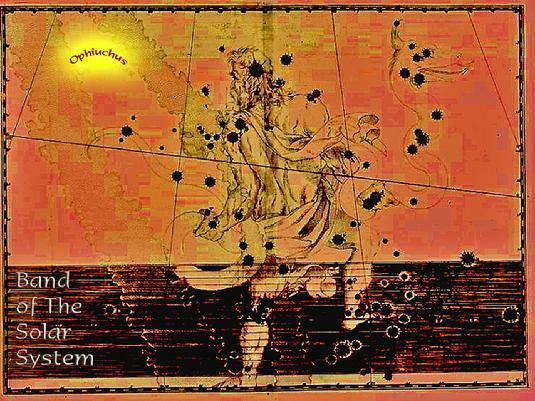 Click Image To Enlarge: "OPHIUCHUS"
The story of man's search for Immortality & eternal youth. He was also "a friend to mankind". Ophiuchus, the Constellation, carries a snake and was known as "The Snake Charmer" (homage to "Kill Bill"). His foot rests upon the head of Scorpio. .... killed anyone who sought out this abode of the gods. Astronomically, the girtablilu were the "gatekeepers" of the Horizon. They welcomed the sun's rising in the morning and shepherded the sun's return below the horizon at evening. They were the keepers of "Daily Life", but; they also prevented access to the realms of "darkness"... or in this case, "the realm of secrets". may have included an Age of Ophiuchus? NOTE: This time frame would also have coincided with the Beginning of one of the Hindhu "Ages of Twilight" (17,215 BC) prior to the Dawn of Dvapara Yuga in 15,703 BC. The Pole Star would have been near Vega. So: an "Ophiucan" would have had to "master & control" the scorpion ( one's personal physical desires, emotional desires, & intellectual desires for power) before "handling the snakes" (the secrets of youth & immortality). Ophiuchus' next association was with no less than "GILGAMESH". Gilgamesh wanted the secret of Immortality and sought out the Sumerian "Noah", Ziusudra... ["Utnapishtim" or "Atra-hasis": Akkadian] who now lived with the gods and was, himself, immortal. Gilgamesh had to fight his way past a "monster like guardian" and the Scorpion-men (fierce guards) at the entrance to the Dilmun; the place of the sun's rising and said to be the orignal Garden of Eden. Utnapishtim disappointed Gilgamesh, stating that the gods would not allow Gilgamesh to be made Immortal. Still, Utnapishtim feeling sorry for Gilgamesh, granted him the secret of eternal youth.... for the length of his life. To concoct the medicinal that granted eternal youth; Gilgamesh had to seek out a special plant, covered in thorns, that grew underwater. That was the plant which held the secret of eternal youth. Gilgamesh, with great difficulty, did retrieve the plant. He was all set to prepare the medicine when.... he got careless. He left the plant lying out in the open.... when while pre-occupied with exulting his success, he failed to notice when a Snake happened along .... and stole the precious plant away. Why Gilgamesh couldn't dive for another one we are not told. But that was the end of Gilgamesh's dreams of youth & vigor into old age. It is said that the Constellations of Serpens the Snake with Ophiuchus as Gilgamesh ... are forever linked by their connection to the pursuit of Eternal Youth & Health and the struggle to maintain it. Might This hold true for all "Ophiuchans"? The Snake had the Secret (Plant) of Eternal Youth (it does renew itself by shedding its skin) & the medical caduceus with entwined serpents is a sign of health & healing to this day. Gilgamesh is left to continued his struggle with Serpens and contemplate his carelessness & his eventual loss of eternal youth. Tiamat was (among other associations) the name for an earlier & larger planet Earth .... BEFORE (according to the Sumerians and Zecharia Sitchen's translations) Marduk/Nibiru's satellites turned 1/2 of Tiamat into the asteroid belt, Miranda, Titania, Oberon, Uranus' rings and splattered some of it onto Nereid (Neptune's Moon). Tiamat's other "half" became our Earth (now called KI) bringing with her our now dead "Moon" (Kingu) which once harbored life. Pluto which was once said to be Saturn's moon became the newest outer planet and Tiamat's "surviving half" settled into orbit between Venus & Mars. Might this shed some interesting light on why Saturn-Pluto aspects can be so strong? Nibiru was characterized to as a "dragon or sky serpent" and a "bringer of death". Ophiuchus' hand that holds the serpen's head is called the "hand of death". Ophiuchus himself is sometimes referred to as: "The Man of Death". Nibiru is said to have brought death to Tiamat. Who then, might this Ophiuchus be .... that wrestled with and mastered the Serpent of Death? Scorpio rules Death in the current Zodiac. But at one time .... Ophiuchus had to deal with her. Tiamat ... 1/2 of which now composes our Earth; was a Water Planet known for "dragons, serpents, scorpion-men and mer-people". The number "8" is associated with Ophiuchus ... his constellation begins where Scorpio (the 8th Zodiacal constellation ) ends. Ophiuchus is also referred to as "The Serpent Holder"
In Babylonian Tablets (for instance - "K". 2894, Ob. 1. 12) is mentioned the Constellation of "Nutsirda" the "Prince of the Serpent". In the Semitic tongue he is called: Namass� ... "The Reptile". 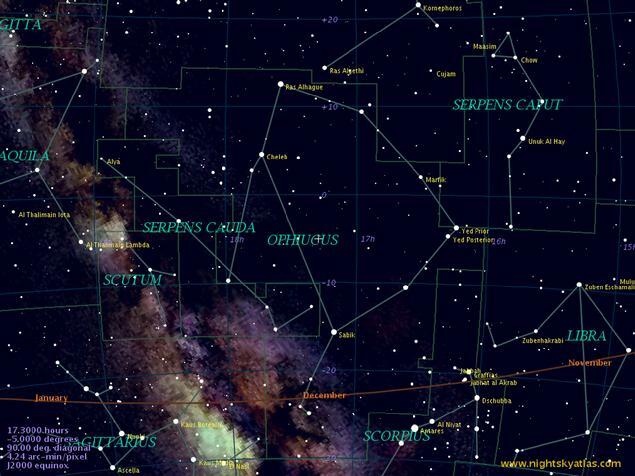 In the Asterism Ts�r; Ophiuchus appears as a lunar mansion. wrote that Adam, Seth, Enos and most of the Patriarchs were great Astrologers as was Abraham who gave instructions in Astrology to both the Egyptians and the Chaldeans. The Chaldeans were said to have received their instructions in Astrology from the Egyptians. Josephus wrote that he had personally seen the 2 Pillars of stone on which Seth had recorded the basics of Astrology in order to preserve the information from the upcoming destruction of the Flood.